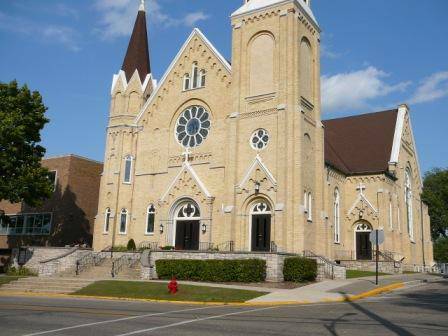 We are a Catholic community of the Milwaukee Archdiocese, located in Beaver Dam, Wisconsin, rooted in three histories. St. Katharine Drexel Parish was formed in 2003 from the merger of three parishes: St. Michael (Madison St.), St. Patrick (Maple Ave.) and St. Peter (Spring St.). Our current church building is the old St. Patrick's church. As a combined family, we are after St. Katharine Drexel, who was born into a wealthy family in Philadelphia, but had a great love for the poor, especially Native Americans and African Americans. She was canonized by Pope John Paul II on October 1, 2000. Her feast day is March 3rd. What are we doing at this time? We are beginning major renovation on our church and school buildings to improve accessibility, security, and gathering space, all of which are greatly needed. We'll be getting newer, bigger, and more accessible bathrooms, renovating interior and exterior, upgrading the church sound system, and more! See our renovation website for more. We are family orientated, cooperative and caring. We celebrate our faith through Word and Sacrament. Having worked together in shared ministries, we are committed to service and the work of justice. We extend Christian formation to all ages. We are committed to youth through St. Katharine Drexel School and religious education programs. We encourage you to get involved with your parish, join an organization, choir, or actively help celebrate our worship services. Share your time and talent helping others. By committing yourself to help build the kingdom of God, you will feel like you belong. Welcome to the excitement of St. Katharine Drexel Parish, Beaver Dam, Wisconsin.